Michael Horst has always been a talented musician. At Desert Vista High School in Phoenix, he played baritone sax in the marching band, piano in the jazz band and cello in the orchestra. As a junior, he was selected to perform with the national group Bands of America in the Rose Parade in Pasadena, California. A few months later, he played piano with the National Honor Orchestra. In high school, Horst also took the most challenging math classes that were offered. As a senior, he mastered calculus three and differential equations, and along with the MAT300 and other courses he had taken during the summer at ASU, he accumulated about four semesters worth of a math degree. His adviser told him he should declare a major, and math seemed like the obvious next choice. Horst graduated last week with bachelor degrees in both mathematics and music composition, and was selected as the College of Liberal Arts and Sciences Dean’s Medalist for the School of Mathematical and Statistical Sciences. He proudly carried the school’s gonfalon during the CLAS Convocation ceremony on May 15 at Wells Fargo Arena. Renaut said it was truly inspiring to work with Horst. “I have been constantly astonished at his work ethic and overall interest in a broad education. 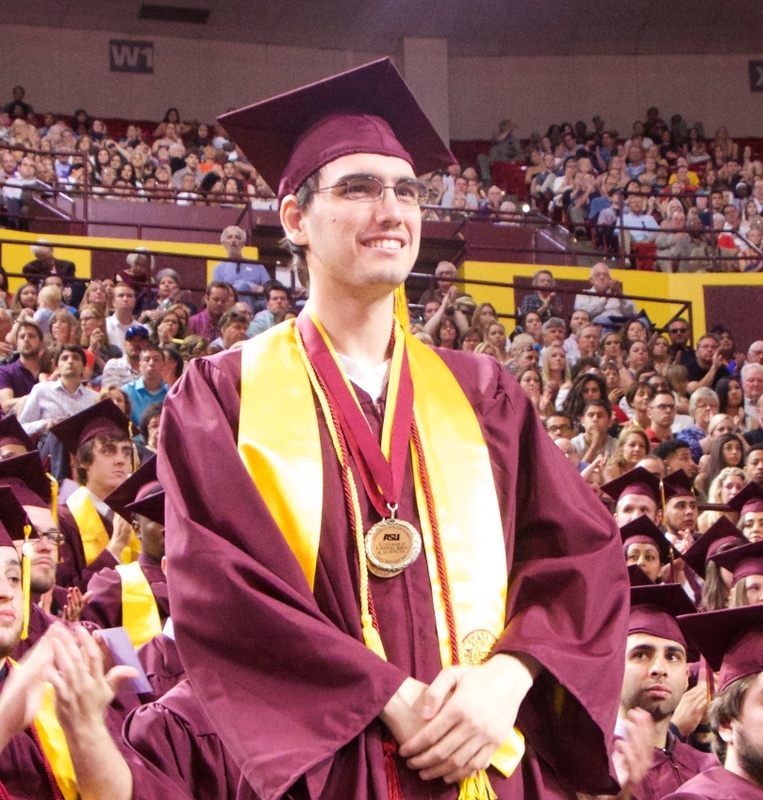 In completing his studies at ASU, he has taken a route that is far from easy, regularly taking more than 20 credits a semester, almost always earning a semester GPA around 4.0, even while taking challenging graduate level courses in mathematics. Horst also had the opportunity to attend the Field of Dreams conference in October, which he described as “really nifty.” The conference brings together faculty in the mathematical sciences and students who are from backgrounds that are underrepresented in those fields. “I think it’s a good thing,” he added. Horst agreed that math gets a bad rap in society. “As for math in general, yeah, there’s a lot of math phobia. And it’s a very real thing. I still have math phobia in combinatorics. I’ve gotten over it a lot, and it’s very intense and very unfounded for the most part, at least for me. Some people I’m sure are legitimately bad at math, but it is upsetting being questioned, ‘When am I going to use this in my life?’ [It] only ever happens in a math class." “People don’t seem to realize that being forced to try different things in a variety of fields is there just to make you more elastic and more intelligent. I don’t know much about neuroscience, but I think the act of trying is in fact what makes one literally more intelligent from a synaptic level. And sure, you’re not going to necessarily have to be finding the area of this whatever in your daily life – but having that form of problem-solving skills is incredibly important. The ASU Lodestar Center was awarded a $140,000 grant from Freeport-McMoRan Foundation to continue funding important capacity building efforts for nonprofit organizations. For the past five years, the ASU Lodestar Center for Philanthropy & Nonprofit Innovation has partnered with Freeport-McMoRan Copper & Gold to build the capacity of nonprofit organizations in selected communities. Through a series of trainings and offerings, this partnership has allowed nonprofit organizations additional access and assistance to help them become more sustainable. Now more than ever, nonprofit organizations are called upon to serve great community needs with extremely limited resources. This challenge is great for all nonprofit organizations, but even more so in rural communities. In order for nonprofits to be successful, it is critical that they are not only managed efficiently and effectively, but also that they operate with a focus on sustainability. Equally important to nonprofit organizations’ understanding of sustainability is the emphasis of local leadership on supporting sustainable programs and building collaboration that increases longer-term sustainability. Furthermore, it is increasingly necessary for organizations to work together along a collective impact continuum that requires coordination and collaboration around issues of systemic change and joint funding strategies. The new program coordinator will work with key community stakeholder groups to plan and implement a range of capacity building efforts that elevate the nonprofit capacity building work in targeted Freeport-McMoRan locations and incorporate the center’s resources as the knowledge and tools leader for nonprofit effectiveness.